When Jackie Kennedy led a television crew through the White House in February 1962, millions of Americans were riveted to the screen. This Wednesday, when Michelle Obama appears on The Colbert Report, it will be a much less exciting, and more commonplace event. 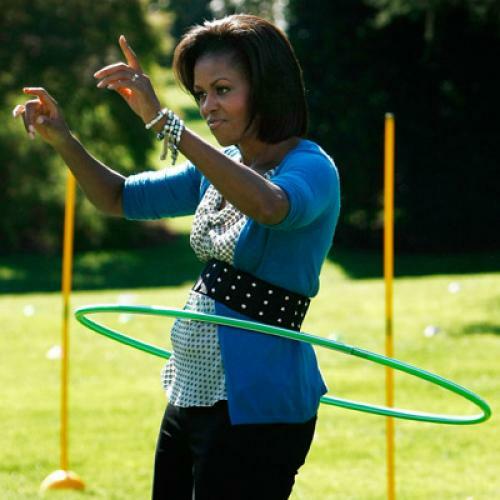 It’s starting to seem like the First Lady has been everywhere on our televisions lately, celebrating her “Joining Forces” initiative to help military families or promoting her “Let’s Move!” campaign to combat childhood obesity. While it’s customary for the spouse of the president to spearhead a feel-good campaign like literacy promotion or urban beautification, few have used their fame as Michelle has, or brought as much pizzazz to their projects. (It’s tough to imagine Nancy Reagan teaching Americans how to Dougie.) In an era when celebrity can be the best way to bring attention to a cause, Michelle appears more determined than any previous First Lady to pursue her public advocacy via TV stardom. On January 16, the First Lady had a cameo role on the popular Nickelodeon sitcom“iCarly.” In it, she praises the military brat Carly (Miranda Cosgrove) and friends for reaching out via webcam to wish Carly’s father a happy birthday—a gesture in the spirit of the Joining Forces initiative. In late January, Obama made an appearance on “The Tonight Show with Jay Leno” during her press tour. The highlight came when the First Lady jokingly chided the hefty host about his lack of fruit and vegetable intake. Michelle put those famously toned arms to work on the “The Ellen DeGeneres Show” when she participated in a good old fashioned push-up contest. And it turns out those arms aren’t just for show: The First Lady didn’t even break a sweat as she decisively beat Ellen in the on-air competition. Continuing on the late night circuit, the First Lady appeared on “Late Night with Jimmy Fallon” and challenged the host to a pentathalon. Promoting both literacy and muppets, the First Lady shared a stage with Kermit the Frog to read “The Night Before Christmas” last December.